A sprained ankle means one or more ligaments on the outer side of the ankle are stretched or torn. Typically the ankle is rolled either inward (inversion sprain) or outward (eversion sprain). Inversion sprains cause pain along the outer side of the ankle and are the most common type. Eversion sprains along the inner side of the ankle may be a more serious injury to the tendons or to the ligaments that support the arch. An orthopedic surgeon should always evaluate ankle sprains. A sprain can be difficult to differentiate from a fracture without an X-ray. If a person is unable to bear weight or there is significant swelling or deformity, the ankle may be fractured, not sprained. After the examination, the DOC orthopedic surgeon will determine the grade of the sprain to help develop a treatment plan. Sprains are graded based on how much damage has occurred to the ligaments: Grade I mild, II moderate, or III severe. Rest the ankle by not walking on it. Ice the injury to reduce swelling. Compression controls swelling, immobilizes and supports the ankle. Elevate the foot above the heart. Swelling usually goes down within a few days. For a Grade II sprain, identified by partial tearing of the ligament, moderate tenderness and swelling, and an abnormal looseness in the ankle that the physician can determine during the examination, follow the R.I.C.E. guidelines, allow more time for healing, and he or she may immobilize the sprained ankle with a splint or boot. For a Grade III Sprain, identified by a complete tear of the ligament, significant swelling and tenderness, and substantial instability, follow the R.I.C.E. guidelines, support the ankle and protect it from sudden movements. 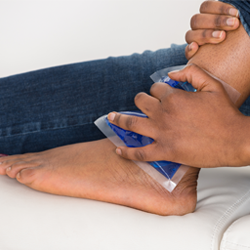 Grade III sprains may require a short leg cast or cast-brace for 2 to 3 weeks. Surgery may be needed to repair the damage. Sprains, from mild to severe, need rehabilitation. The DOC physical therapist will design a customized rehabilitation program, including strengthening, balance, endurance, and agility exercises, to prevent stiffness, increase range of motion, improve ankle strength, and prevent chronic ankle problems. With a proper diagnosis, treatment and rehabilitation, most guests resume their day-to-day activities in two to four weeks. However, successful outcomes depend upon his or her commitment to rehabilitation. Incomplete rehabilitation is the most common cause of chronic ankle instability after a sprain.